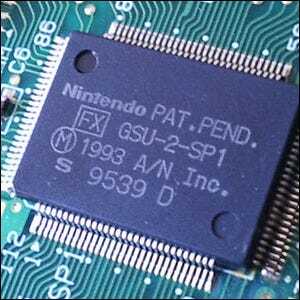 Which Game Console’s Cartridges Featured In-cartridge Co-processors? Which Classic Board Game Was Originally Paper Based? Nintendo invested an enormous amount of money in developing and marketing their Super Nintendo Entertainment System and they wanted to maximize the life cycle of the console. Rather than limit games to accessing only the hardware within the SNES console itself, Nintendo built support into the console for in-cartridge processors. When a game came along that needed extra processing power, they could simply add a processor onto the board within the cartridge to help out. The first game to feature such a co-processor was Pilotwings (1991). Pilotwings was followed by dozens of co-processor enhanced titles including: Super Mario Kart, Star Fox, and Mega Man X3. If you’re curious whether an old game has an add-on process, cartridges enhanced with an on-board processor included an additional 16 pins on the edge of the cartridge interface.